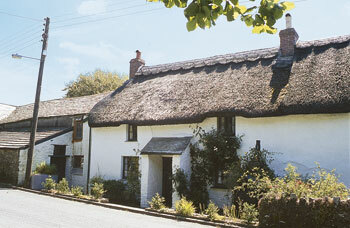 Bell Buoy Cottage is a pretty two bedroom thatched cottage situated in Morwenstow, near Bude, which dates from the 18th century. 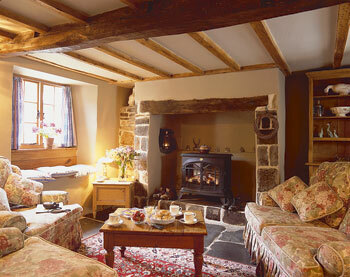 It has been well furnished and retains many original features such as an inglenook fireplace, beams and low ceilings. It has a lovely secluded south facing garden. The superb sandy beaches of the north coast, excellent coastal walks (1Â½ miles), golf, fishing and horseriding are all available nearby. Bude with its many shops and restaurants is just 9 miles. Village shop 100 yards. Pub and tearooms 1Â½ miles. Narrow lanes run westwards fromt he coast road to this tiny, isolated village whose name recalls Morwenna, a 9th-century Celtic saint. The ancient church, sheltered by wind-bent trees, is a 10 minute walk from the cliffs where Morwenstow's most famous vicar, the eccentric Robert Stephen Hawker, built a driftwood hut in which to write his poems. Hawker also built the vicarage whose chimneys are scaled-down replicas of church towers. The land between the church and the cliffs is National Trust property dedicated to Hawker's memory. Two bedrooms. Cosy beamed sitting room with electric 'stove effect' fire in inglenook fireplace and rugs on slate floor. Dining room with door to private south facing garden. Small kitchen. Bathroom/W.C. (shower over bath). Waxed wooden staircase to first floor: Beamed double bedroom and twin bedded room both with wooden floors and rugs.